Original article can be read on CharityComms. Talking about death and money are two of the biggest taboos for Brits. It poses an inevitable hurdle when planning the annual awareness campaign, Remember A Charity Week, with our core goal being to normalise gifts in wills and to lay the foundations for a world where everyone considers donating when writing their will. The biggest challenge for us is creating a campaign that will enable each of our 200 member charities to get their own legacy conversations started. So in 2018, we took an entirely new tack. We decided to create a digital platform that showcased how charities and the people working behind them are tackling some of the world’s biggest issues and how powerful a legacy donation can be in achieving change. By sharing stories from real people on the platform we hoped it would help to break down taboos and initiate conversations about gifts in wills. Technology has opened the doors for charities to interact with supporters and engage them with the cause. But it’s important not to forget the collective power, knowledge, empathy and wisdom that people possess. Instead of a typical search engine powered by algorithms, the Human Search Engine (Human) was designed to feature real people’s responses to questions. We surveyed the public to identify people’s burning questions, looked at the issues that charities address and then built a platform to share that knowledge. Together with member charities and our agency partner Atomic, we filmed a series of videos with spokespeople (including supporters) exploring what each organisation is doing to resolve a particular issue and how important legacies are in funding that work. These ranged from finding a cure for cancer to helping the homeless and conserving wildlife. 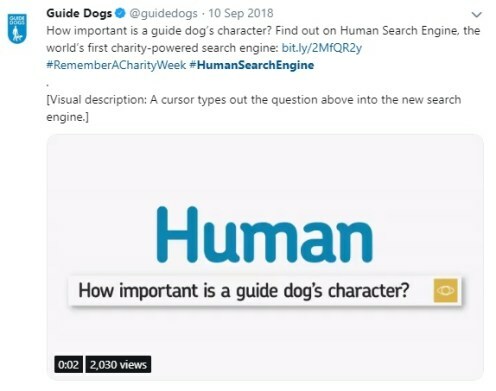 This footage and videos recorded by charities themselves were used to populate the site, building a range of answers that the search engine would return to users. Some of the most effective and emotive videos were those created by member charities, often raw and uncut, recorded simply on a mobile phone. Charities were provided with their own bespoke Human webpage alongside suggested media posts to promote and share with their own supporter base. All this content was highly shareable, lending itself to a range of digital and social communication channels, enabling us to reach an even larger audience with the campaign. Did Human achieve its objectives? Ultimately, our goal is a long-term one: to motivate people to consider leaving a gift in their will and to normalise that behaviour. To achieve that we must deliver more than a generic legacy message, creating an opportunity for all our members to get involved and make the campaign their own. Human exceeded our expectations in terms of engagement (both among charities and the public). Member charities played an active role with 80% sharing content on social media, amounting to over 2,800 posts about what legacies have enabled them to achieve. There was great demand for campaign assets, with charities ordering thousands of posters and other marketing materials. We also created around 150 bespoke charity landing pages for the Human website, tailored to individual causes. When it came to public engagement, the search engine attracted over 22,000 unique visitors during the week itself. More than eight in 10 referrals to the website came from social posts, showing just how important social media was in driving traffic to the search engine. We bolstered this with a paid social campaign, achieving over 3.7 million impressions. The web and social content were widely shared by charities and supporters alike, and our member charities reported an increase in legacy enquiries during the week itself. As a result, the Human Search Engine lives on and we continue to drive traffic there, encouraging the public to consider a legacy. In a world where digital is king, and face-to-face interactions are minimal, humanising our communications is important. 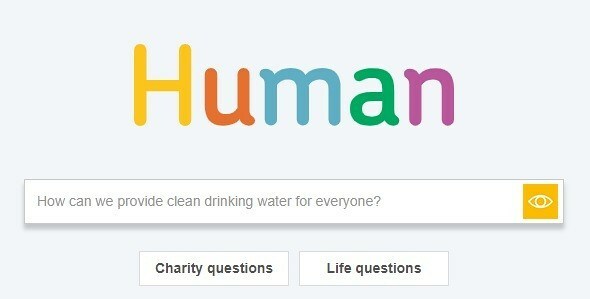 The Human Search Engine created an ideal platform to share people’s unique thoughts, wisdom and passion for the cause, demonstrating what can be achieved by leaving a legacy. What did we learn? Digital and social channels enable you to reach new audiences and build engagement at relatively little cost, while also allowing you to be targeted in your approach. It can be a great way to get the legacy conversation going and to initiate supporter relationships. Video storytelling can be extremely powerful and build engagement. Using real human faces and voices made the legacy message much more personal and relatable. After all, it’s the people behind the brand that connect with others, drawing empathy and emotion which are key to people’s decision-making process to donate. While it’s important to prepare, having storytellers reading from a script or autocue isn’t always the answer. Some of the most emotive and inspiring videos we recorded were unscripted, where people spoke freely and with passion about the charities they support. Similarly, raw and authentic smartphone footage often has the potential to pack a heavy emotional punch.